Ever since I first saw those Emersonmade flowers floating around in blogworld, I couldn't stop thinking about them. They are absolutely fabulous - hand cut and stitched. Just beautiful. 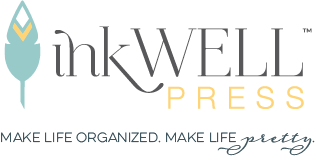 But seeing as I'm on this spending hiatus I just can't shell out $65 for a pin no matter how beautiful... so I decided to make my own and thought you might like to do it too. Only without all that hand cutting and stitching. Let's cheat and use a shortcut, shall we? Make sure the flower you purchase is doesn't look really cheap to begin with - pick a nicer quality one. Mine cost $3.50. Use your wire cutters (if you don't have wire cutters, any good pair of pliers will have a wire cutter built into them) to cut off some of the stem. Cut close to the base of the flower but with enough stem left to keep holding the flower together. Take your fabric glue (you could use hot glue if you'd rather) and lift each petal up so you can put a small dot of glue at the base of the petals. You want to do this for each petal. You are essential gluing the flower together. Don't put the glue on too liberally as you don't want the flower to be stiff. Allow it to dry completely. Once the glue is dry, you can snip off the rest of the stem and remove any of the plastic pieces. Using your E600 (or again, you could use hot glue) place some glue on the bar pin (which you can find in the jewelry findings section of your craft store). A package of bar pins will run you about $2 for 60. 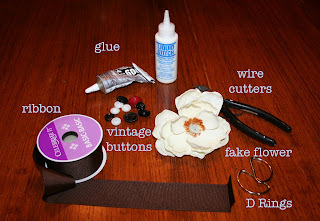 Add a dab of glue to a vintage button and use that as the centerpiece of your flower. I always have vintage glass buttons around (etsy is a great place to buy these). That's it for making the pin! Same supplies but add in some ribbon and D Rings (available in the belt supply of your craft store). 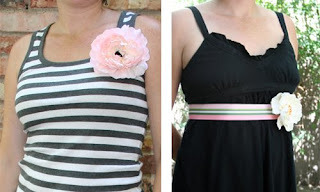 Make your flower just as you did before (decide if you want to use the pin or would rather glue it on the belt). Measure out how long to make your ribbon. Just wrap it around your waist to figure it out. Allow a little bit extra for seams. Use an iron to turn under the ribbon a 1/2 use some fabric glue to hold it in place. Turn the ribbon under again, making sure the D Rings are inside the loop. Glue it down (on the striped belt I made I actually stitched it on the sewing machine. Took 2 minutes). Repeat this process on the other end of the belt (obviously without the D Rings). You can attach the flower by gluing it onto the belt close to the D Rings. 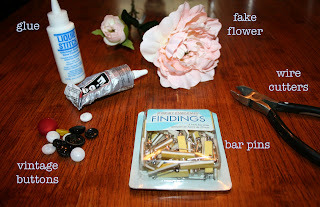 Or, you can do like I did, which was to just attach a bar pin to the flower and then just attach it on using the pin. That way you can use it 2 ways - as a belt and as a pin. Total cost to make 2 pins & 2 belts? Around $10.